An elderly woman standing outside her half-constructed toilet at Bhagwan Pur, Mohan Gunj, Lucknow. The village was declared open defecation-free in June 2018. Our investigations reveal that even as toilet usage and awareness has grown in Uttar Pradesh, the race to declare districts open defecation-free has led to inflated official figures and shoddy toilet construction. Raebareli, Lucknow, Bijnor (Uttar Pradesh): Anshika Patel, 24, does not like waking up at 3 am but she has no choice. Come winter or rain, guided by the light of a cell phone flashlight, Patel, along with four or five women, heads out with a bucket or a bottle to two nearby roads. This early morning trip is for a search of a clean spot to defecate–the Patel locality in Vishun Pur in Rae Bareli district in western Uttar Pradesh (UP) has no toilets. Since their village is close to town and is developing fast, there are no open fields where they can defecate. Anshika Patel (left) from Vishun Pur, Rae Bareli, has to look for a place to defecate on the side of a road, at 3 am, because her locality does not have a toilet. Yet, the Uttar Pradesh village has been declared open defecation-free. These women should not be risking their lives each day to defecate; Patel’s village, Vishun Pur, is officially open defecation-free (ODF) as records show toilets in each of the 404 households, per the Swachh Bharat Mission (SBM) website. Similar to Vishun Pur, our ground investigation in three UP districts revealed that even as there is ground-level behaviour change with awareness and greater toilet use, in the race to declare districts open defecation-free, the government has inflated numbers and sanctioned shoddy toilet construction. With inadequate focus on the quality and sustainability of toilets, India risks reversing the great strides it has made in improving sanitation, experts said. “Sanitation is a flow problem and not a stock problem. It cannot be solved in a day, it needs an on-going solution,” said Devashish Deshpande, a senior research associate with Accountability Initiative, a think tank based in New Delhi, that conducted independent verification of ODF villages in Rajasthan. UP–with a population of 204 million, equivalent to that of Brazil and with 3% its area–has been one of the biggest contributors to India’s poor status in sanitation. As of October 2018, UP along with Bihar, Jharkhand, Odisha, West Bengal, Telangana, Assam and Karnataka, were the only big states not declared open defecation-free by the government. If government figures are to be believed, sanitation in UP has improved: In 2014, only 35.2% of the state’s households had a toilet, in October 2018, 99.9% did, as per government data. UP was slated to be declared “open defecation-free” by October 2, 2018, but the deadline was extended by three months, to December 31, 2018, as the work had not been completed nor verified, according to news reports. We visited three districts of Uttar Pradesh–Lucknow, Rae Bareli and Bijnor–to investigate how the Swachh Bharat Mission (Clean India Mission), Prime Minister Narendra Modi’s pet programme, has been implemented in the state. This story continues a FactChecker series evaluating the government’s flagship programmes in the run-up to the 2019 general elections. The first of this series investigated the government’s rural-jobs programme (here, here and here); the second spoke about the Swachh Bharat (Clean India) Mission’s sewage problem, and the third (here, here and here) evaluated the Pradhan Mantri Sahaj Bijli Har Ghar Yojana (The Prime Minister’s electricity-to-all-homes programme). While the Swachh Bharat Mission is four years old, it was implemented in full steam in Uttar Pradesh only since 2017, after the Bharatiya Janata Party (BJP) won state assembly in March 2017, according to state-level officials. In May 2017, Chief Minister Yogi Adityanath announced that UP would be ODF by October 2018. Based on that deadline, 15.5 million toilets should have been constructed in 75 districts in 17 months to October 2018. The state constructed 14.1 million toilets–90% of the target—in seven months from April to October 2018, according to UP’s Minister of State, Bhupendra Chowdhury. This would mean over 2 million toilets were constructed each month which equals 67,142 toilets every day and 47 toilets every minute. Massive field resources would be needed for monitoring and building these toilets, as we found in the SBM “war room” at Bachharawan block. The room consisted of U-shaped desks with computers on either end to ensure that the system is constantly updated with data on toilet construction. Shweta Yadav, block coordinator, with Alok Shrivastav, a computer operator, at Bachhrawan block, Rae Bareli. Block level officials like Yadav are responsible for monitoring and evaluating Swachh Bharat activities including the construction of toilets. 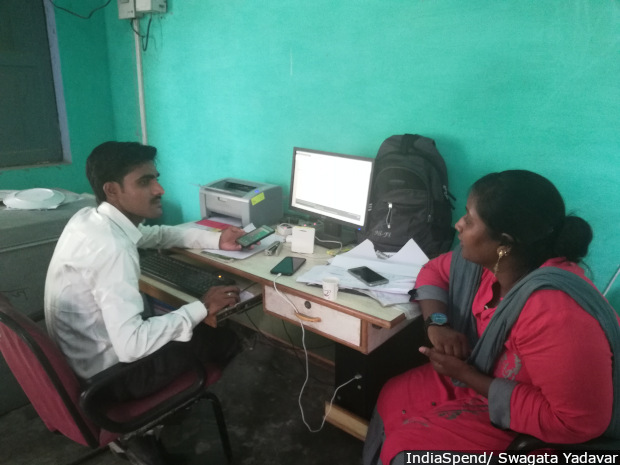 “Before 2016, there weren’t many resources or manpower assigned for the SBM in the district”, said Nidhi, the prerak (motivator) for SBM in Rae Bareli district, who goes by one name. SBM preraks are young professionals, employed through a partnership between TATA trusts, a philanthropic organisation, and the ministry of drinking water and sanitation, to help implement SBM in the district. In the four years, from 2014 and 2018, only about 40,000 toilets were constructed in the district. The number rose to 150,000 toilets in 2018-19–75% of the 200,000 toilets that were needed, Nidhi said. As many as 83.61% of villages in Rae Bareli are ODF, according to the SBM website. “I made 82 toilets in 40 days; the target was 160,” said a private contractor, who wished not to be named. He said most of the work began after August this year. He said gram pradhans (village heads) hired contractors to meet the target because transferring money to homeowners did not help complete the work targets. The Swachh Bharat Mission “will work better if we have more time”, he said. Given the new SBM guidelines, there should not be a discrepancy between SBM data and toilets on the ground. 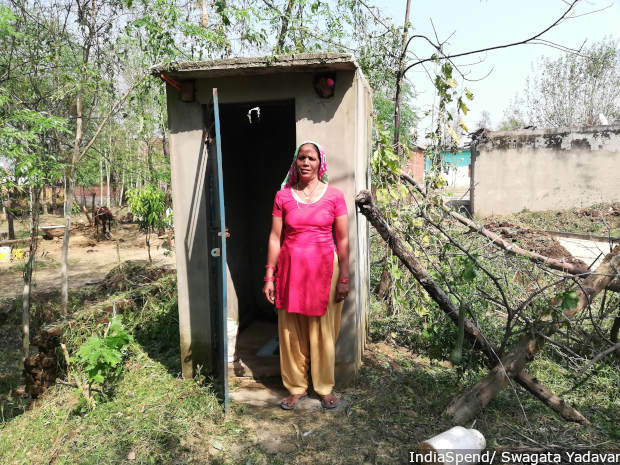 In UP, the second installment of the Rs 12,000 given to construct toilets is paid only after there has been some progress on the actual construction of the toilet, ensuring that the complete money only goes to those who actually construct the toilet. After the toilet is completed, it is photographed and geotagged (where the exact location of the toilet is marked on a Google map) and then sent to the block office for confirmation. It is then that block level officials upload the data. Yet, many toilets marked on the system are missing. “Half of the households in the village (of Vishun Pur) do not have toilets,” said Ram Naresh Rawat, husband of pradhan (head) Babli Rawat and de facto village chief of Vishun Pur, an open defecation-free village. Of 1,100 households in the village, he said, only 105 toilets have been built. “The rest will be constructed in a month and a half,” said Rawat. How did the village become ODF then? “I don’t know, I didn’t send any such declaration. Maybe the block office did,” he replied. No toilets have been built in Sehgaon Paschim Gaon of Baccharawan block, where, according to the SBM website, 500 of 502 households have a toilet. The village, surrounded by lakes on three sides, is connected by a single road to the mainland. The area bordering the lake is where the village defecates. Vinod Kumar Chaudhary, village head of Sehgaon Paschim Gaon, Baccharawan block, Rae Bareli, said no toilets have been built under Swachh Bharat Mission (SBM) despite the fact that the SBM website claimed 500 out of 502 households have a toilet. “Humein sharmindagi mehsoos hoti hai (We feel ashamed),” said Rajkumari, 35 and mother of four. Sometimes vehicles startle them, sometimes young boys kick their lotas (tumblers) away. Once when Rajkumari was defecating behind a bush, she suddenly heard a man cough, who was already defecating a little further down. “I ran away from there and could not look at that man in the eye for the next six months,” she recalled. Villagers have resigned themselves to defecating in the open. “Hum bahar nahi toh kaha jayein? (If not out, where do we defecate? ),” asked 70 year-old Ramkali. We called and messaged the Rae Bareli DPRO, Upendra Singh, several times, but did not receive a response. We have also sent emails to the state’s secretary of drinking water and sanitation and to the Swachh Bharat Mission director seeking their response and will update the story if and when they respond. Similar cases of ‘paper’ toilets have been found in various news reports. For instance, 40 villages declared ODF were found to have incomplete and dysfunctional toilets during an inspection by state authorities in Lucknow district, according to this October 2018 news report. In 2012-13, a nationwide baseline survey was conducted to find out how many households did not have access to toilets. 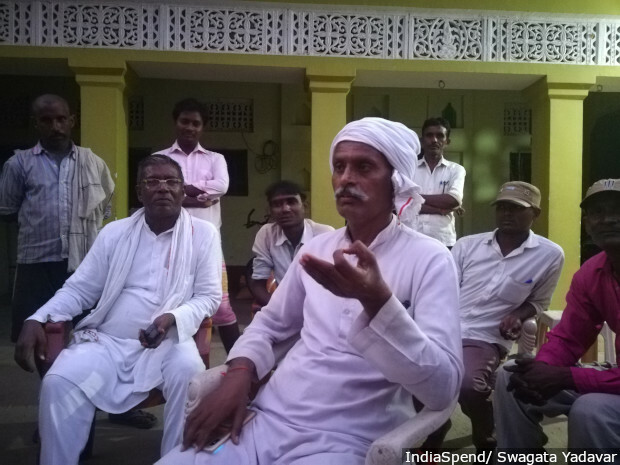 The survey asked gram pradhans (village heads) to send a list of households without toilets. Everything from SBM targets to fund allocation was based on the figures cited by this survey. “At that time, no one knew what the survey was for and it was done in a hurry,” said Deshpande of Accountability Initiative. He identified three fundamental problems with the 2012-13 baseline survey: If the survey identified 100 toilets to be built of the 120 toilets actually needed, only 100 toilets would be constructed under the programme; secondly, the target remained static over the years. Then, there is the problem of prematurely declaring a village ODF. “If you reach a certain proportion of the target, say 80-90%, you declare that you have reached the target,” he said. So even if 20-40% of toilets are not constructed, and the village is declared ODF, no new funds are released and villagers will have to construct the toilets on their own, he explained. Uttar Pradesh recognised this problem and asked gram panchayats (village committees) to send a new list of households including those missed in the first survey in October 2018. It is estimated that households without toilets could be around 150,000 in Rae Bareli, 75% more than the original survey had identified. However, not all villages updated the list of households without toilets, based on this reporter’s visits to several villages. For instance, village heads had not informed villagers or made public announcements to find out about such households. “Whoever is close to the gram pradhans will be added to this list,” said Sangita Devi, a community journalist from Baccharawan block. Like all other villages, the streets around Raipur Neruva in Shivgarh block in Rae Bareli would be filled with faeces every morning. Villagers would cover their faces to protect themselves from the stink and flies when they passed the road. But that has changed over the last couple of months. “DM [District Magistrate] himself came to the village after more than 50 years and felicitated the villagers when it was declared ODF in February 2018,” said Ashok Kumar, 30, a farmer. His household, like 324 other households in the village, has its own latrine. The process started months ago when block officials came to their village and conducted social “triggering” where villagers were made aware of the health, social and environmental effects of open defecation. It is one of tools of the ‘Community Approaches to Sanitation’ that aims to bring the demand for toilets from within the communities–an essential part of the success of SBM. A map of the village was created, open defecation spots were mapped and villagers were explained how flies that sit on the faeces also sit on food and spread diseases. 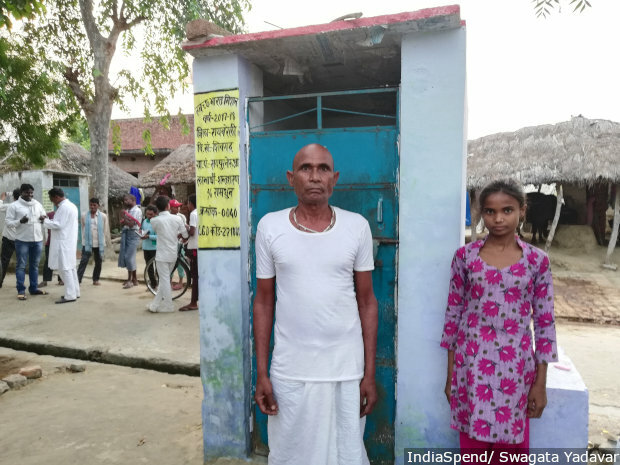 Ramdhan, 60, farm labourer from Raipur Neruwa, Shivgarh block in UP, with his granddaughter near the toilet built under the Swachh Bharat Abhiyan. Their village was among the first in the block to be declared open defecation-free. Funds for the toilets were sent to the gram pradhan (village head) and he arranged for construction material and masons, while the villagers started constructing toilets on their own. The villagers were made aware about the twin-pit design and how the decomposed sludge could be used in the fields as ‘son khad’, literally golden fertiliser. “I have heard it gives larger crops, I have seen my brother-in-law use it in another village,” said Kumar. Young boys and adults were made part of nighrani samitis (monitoring committees) that spread across the village and convinced those going to defecate in the open not to do so. 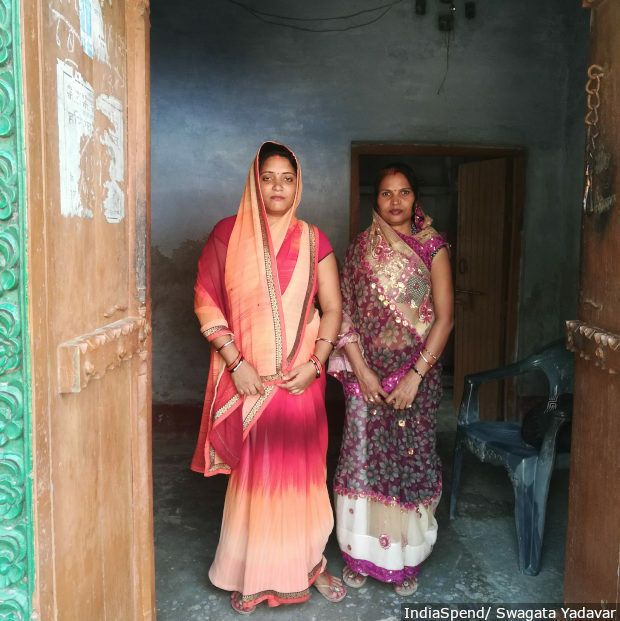 “In every village there are 5% who refuse to listen,” said Ratipal Rawat, former village head whose daughter-in-law Ram Rani is the current village head. The names of these people was announced on loud speakers to shame them. They were garlanded, and, at times, they were even threatened that their rations or pension would be taken away. “We never actually acted on the threats but all our villagers are illiterate and only listen when we threaten,” said Rawat. Now, several months later, no villager goes out to defecate and the village road no longer stinks. “Our village has been transformed,” said Mesham Ayodhya Prasad, 40, a farm labourer. This was the case in two of the award-winning villages we visited, but most others are yet to see such a transformation. Lalpur, in Mohanlal Gunj of Lucknow district, is also an award-winning village, which was declared ODF in August 2016. There is now a solid- and liquid-waste management system, villagers generate organic pesticide and fertiliser, and the villages’ water bodies have been cleaned. However, just 3 km from this village, Bhagwan Pur, which was declared open defecation-free in June 2018, had low quality toilets. Many toilets lacked doors, and some lacked toilet seats. Pappu Kumar, 30, and five other members of his family, still defecated in the open because their toilet lacked a toilet seat, roof and a door. “I do not know when the work will be complete, I don’t know where to complain,” said Kumar. The nullahs or drains in the village were choked and drain water flooded the roads. The awareness about these toilets is low–some men said they still used the fields for defecation because the idea of defecating in a toilet close to their house was disgusting to them. Others did not know about handwashing and had not heard of nighrani samitis (monitoring committees). When asked about the toilets being incomplete and the village still declared ODF, Bhagwan Pur’s village head, Ankur Mishra, said all 203 toilets to be built were completed. “Only about 5-10 households didn’t have toilets and you must have seen one of them.” He also claimed that the village had nighrani samitis (monitoring committees) but because most of the villagers are illiterate, they didn’t know about it. India’s sanitation challenge will not be overcome in a single declaration of being open defecation-free in 2019, warn experts, but experience in states and districts shows that sanitation activities cease after the ODF declaration. The great fear among sanitation experts is not that India may not be able to declare itself ODF in 2019, it is the fear that the work on sanitation may lose steam after the declaration. North UP’s Bijnor district, 160 km from Delhi, and on the basin of the river Ganga, was declared ODF in May 2017 and is among the first three districts to be declared ODF in UP. While Bijnor may be open defecation-free on paper, the sanitation challenge is far from being solved, highlighting the lack of focus on sustainability, and behaviour change. No one in Chhakara village, 28 km from Bijnor, defecated in the open, but there were problems with twin-pit toilet design. Brahmapal Singh, a farmer, and his two sons each got a latrine. “The masons were building twin pits of three feet, we asked them to build a single pit of five feet,” said Singh. “Our toilet and pits collapsed during the flood, I rebuilt the toilet and built a single pit,” said Sunita Rani, 40, another farmer from the village. 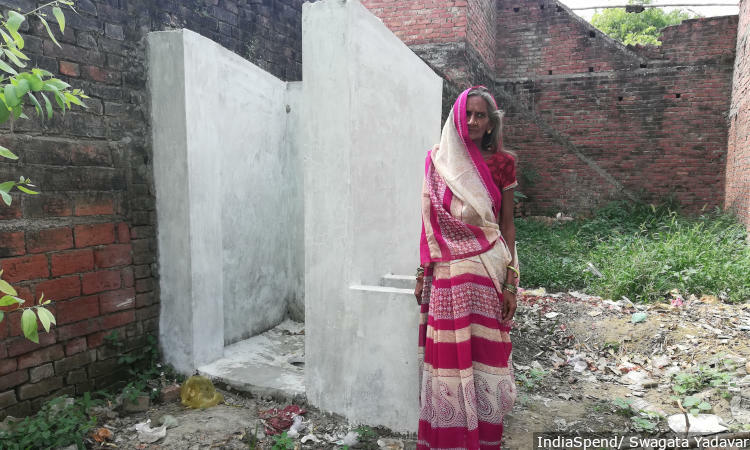 Sunita Rani, 40, Chhakara village, Bijnor district, built her own single-pit toilet after the one made under the Swachh Bharat Mission collapsed. A few others from the villages also admitted making a single pit instead of two shallow pits, in spite of the SBM outreach that explains the importance of a twin-pit design that allows for on-site treatment of waste. In a single-pit toilet, waste has to be emptied either manually or through a machine, once the pit is full. Most toilets had chunks of plaster that was falling off and rusted doors, this reporter saw. “Poor material is used in toilet construction–the plaster and the cement just peels off,” showed Nathuram Kashyap, 50, a farmer from Chhakara. He had built an extension to his well-kept home to build a toilet. But after the plaster and cement started peeling off the toilet, he did not repair it. Others in Gopal pur village, 33 km from Bijnor, also claimed that their pits collapsed in the heavy rains this year. They either connected the latrine to a single pit or stopped using the toilet. Since most of the villagers lived in pucca houses, owned two-wheelers, had a TV and many modern appliances, why didn’t they just repair the toilets? “Yes, we should,” many said, but they had never bothered to repair the toilets, which could show that the villagers do not consider that they own the toilets. Further, some villagers worried about contamination. While SBM field workers had assured them that the twin-pit model was safe, even in areas with a high water table, since the depth of the pits was only about 3-5 feet, villagers were concerned. “We have stopped drinking water from this hand-pump,” which has a toilet barely two metres away, Jaipal Singh, 50, told FactChecker. “Everyone who drinks the water, falls sick,” he said, adding that the men in his family prefer defecating on farmland. When asked if the villagers have begun ODF plus activities–solid- and liquid-waste management, cleanliness of water bodies and safe containment of faecal sludge, among others–the villagers said that nothing was being done. “Yes, I know about ODF plus but nothing is being done here,” said Ghanshyam Singh, village head of Chhakara village. We asked for responses from Bijnor’s DPRO and the SBM district coordinator, and we will update the story if and when we get a response. In the Udaipur study on ODF gram panchayats conducted by Accountability Initiative, none of the nine ODF villages conducted any ODF plus activities. Further even the small budget for solid- and liquid-waste management remains unused–only Rs 79 crore was spent in 2017-18 till January 2019 as compared to Rs 15,343 crore released for SBM rural in 2018-19. “Twin-pit toilets are a strict no in flood prone areas and areas with shallow groundwater as the pits may contaminate groundwater,” said Sushmita Sengupta, programme manager at Centre for Science and Environment (CSE), a New Delhi-based advocacy. “Yet, the government keeps promoting it because it is the cheapest, and easy to build in the Rs 12,000 subsidy the government gives,” she said. Ecosantoilets–toilets that don’t require water and where human excreta is used for agriculture, and are designed for areas with high water table and poor access to water–are being built in Bihar and Tiruchirapalli, and could be a safer alternative, said Sengupta. Just building toilets will not achieve the goal of stopping the transmission of disease, safe containment of faecal sludge so that it does not pollute groundwater, said Sengupta from CSE. Some also question the methods used to bring about behaviour change. “In villages I visited in July and August 2018 in Rajasthan and Madhya Pradesh, some households had been threatened with losing their rations and pensions, or were threatened with police action,” said Sangita Vyas, a PhD student at the University of Texas, Austin. In one village, the headmaster threatened families that did not have toilets that their children would be disenrolled from school, she said. Only 18% of rural households had piped water supply in 2015-16, according to the latest national family health survey, while 17% of rural households have household water connections, according to a performance audit by the 2018 Comptroller and Auditor-General of India. In effect, 83% of rural households continue to rely on community water sources for their needs which means that they need to spend time fetching water even for toilet use. In summer, when water supply dwindles, the availability of water and the time taken to fetch it can determine whether villagers would prefer using a latrine or defecating in the open. The ministry of drinking water and sanitation has announced its intent to provide piped water supply to 90% of rural households by 2022. “If you have to move from 17% to 90% [piped water coverage] it would require political leadership, commitment and an investment, similar to what Swachh Bharat received. Har ghar jal [water in every house, the slogan for the national water mission] has to be as important as the Swachh Bharat Mission,” said V K Madhavan, Chief Executive of WaterAid India, a global non-profit working on water issues. This is the second part of a set of stories investigating the Swachh Bharat Mission. You can read the first part on the sewage problem of the national toilet-building scheme here. These stories are part of a series evaluating flagship government programmes in the run up to the 2019 general elections. You can read a set of stories on the rural jobs programme here, here and here, and on the rural electrification programme here, here and here.